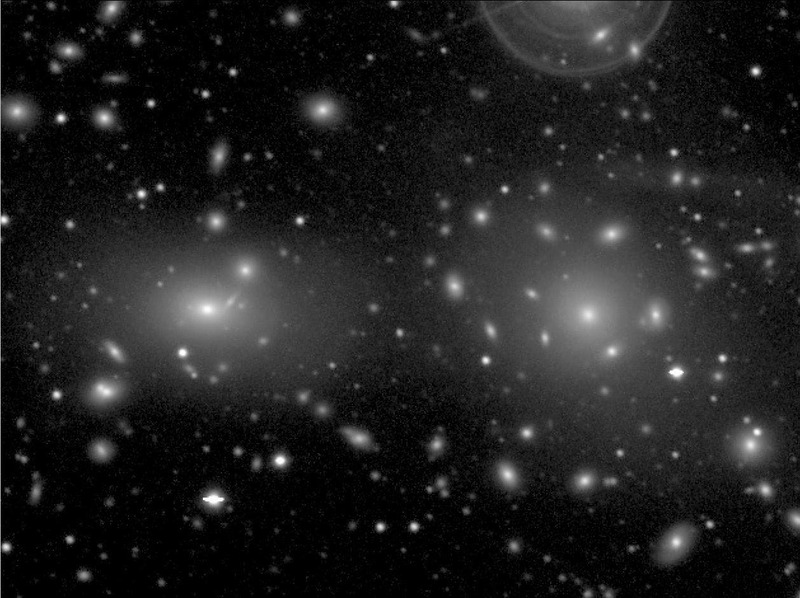 A group of researchers from the Stony Brook University (the State University of New York) and the National Astronomical Observatory of Japan has discovered 854 "ultra dark galaxies" in the Coma Cluster by analyzing archival data from the Subaru Telescope. The discovery of 47 such mysterious dark galaxies was a surprising find in 2014, and the new discovery of more than 800 suggests galaxy clusters as the key environment for the evolution of these mysterious dark galaxies. "Not only these galaxies appear very diffuse," said Jin Koda, principal investigator of the study, "but they are very likely enveloped by something very massive." These galaxies appear very diffuse and remarkably extended as seen by the light of the stars they contain. Many are similar in size to the Milky Way, but have only 1/1,000 of stars that our galaxy does. The stellar population within such fluffy extended galaxies is subject to rapid disruption due to a strong tidal force detected within the cluster. Something invisible must be protecting the fragile star systems of these galaxies, something with a high mass. That "something" is very likely an excessive amount of dark matter. The component of visible matter, such as stars, is calculated to contribute only 1% or less to the total mass of each galaxy. The rest – dark matter – accounts for more than 99%. The Subaru Telescope, with its large-aperture and wide-field camera, used under excellent seeing conditions, revealed that these dark galaxies contain old stellar populations and shows a spatial distribution similar to those of other brighter galaxies in the Coma Cluster. 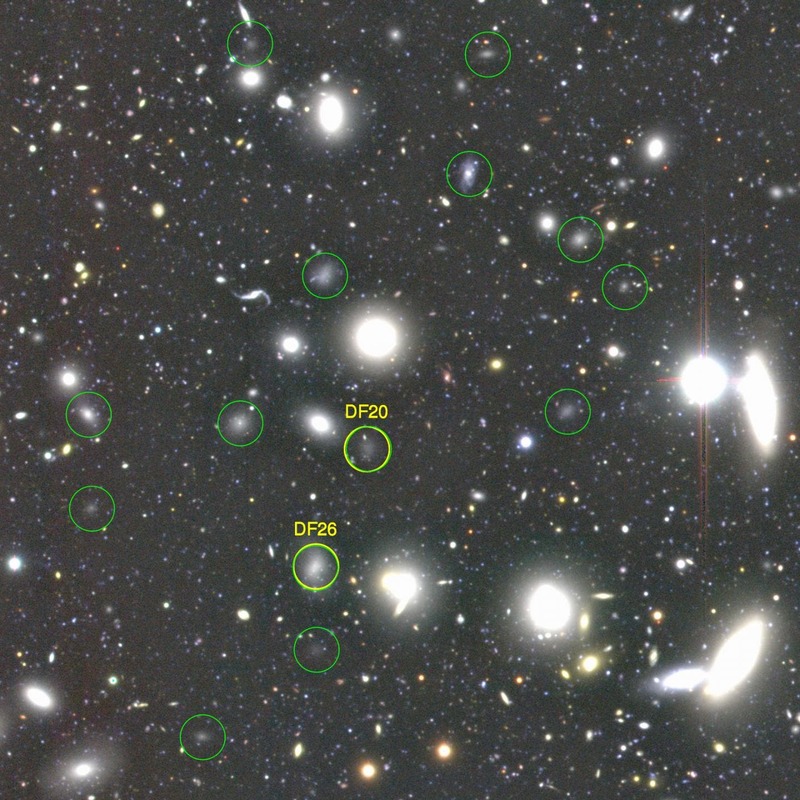 That suggests they have been a long-lived population of galaxies within the cluster. The amount of visible matter they contain, less than 1%, is extremely low compared to the average fraction within the universe. Why are these galaxies dark? Somehow, they lost gas needed to create new stars during or after their largely unknown formation process billions of years ago. From their preferential presence within the cluster, it's likely that the cluster environment played a key role in the loss of gas, which affects star formation within the galaxy. Several loss mechanisms are possible, including ram-pressure stripping by intra-cluster gas, gravitational interactions with other galaxies within the cluster, and gas outflows due to simultaneous supernova explosions triggered, e.g., by the ram pressure or gravitational encounters. These dark galaxies may offer another insight into the model of galaxy formation. However, according to Dr. Jin Koda more work needs to be done to understand them and their place in the standard picture of galaxy formation. "Follow-up spectroscopic observations in the future may reveal the history of star formation in these dark galaxies," he said. In addition to research into galaxies' stellar populations, further investigation of the large dark matter component of the galaxies is essential. Dark matter is invisible, but measurements of stellar motions may expose the distribution of dark matter in these galaxies. Such a dream measurement may not be immediately possible, because they are so faint. It is difficult to measure the detailed motions of stars, even with the Subaru Telescope. The construction of Thirty Meter Telescope (TMT) by an international partnership of institutions, including the National Astronomical Observatory of Japan may well reveal the mystery of the dark galaxies in near future. The image at the top of the page shows super-giant elliptical galaxies NGC 4874/4889 in the Coma Cluster.